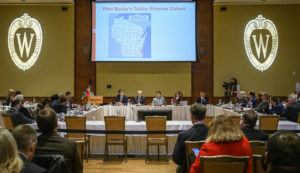 UW-Madison Chancellor Rebecca Blank addresses the Board of Regents during its February 7, 2019, meeting, hosted by UW-Madison. MADISON, Wis. – More than half of the University of Wisconsin System’s buildings were built in the 1950s-70s, and many now require significant repair and renovation work to ensure continued safety as well as to support continued excellence in teaching, learning, and research, according to a UW System capital planning leader. Several biennia of operational budget cuts have resulted in decreased manpower and financial resources to address what are becoming more significant and more frequent issues in UW System facilities, according to Alexandria Roe, Associate Vice President for Capital Planning and Budget, at Thursday’s Board of Regents meeting. “Increasingly, facilities staff are called upon to take care of emergency problems … and this diverts their manpower from doing routine preventative maintenance activities,” she said. 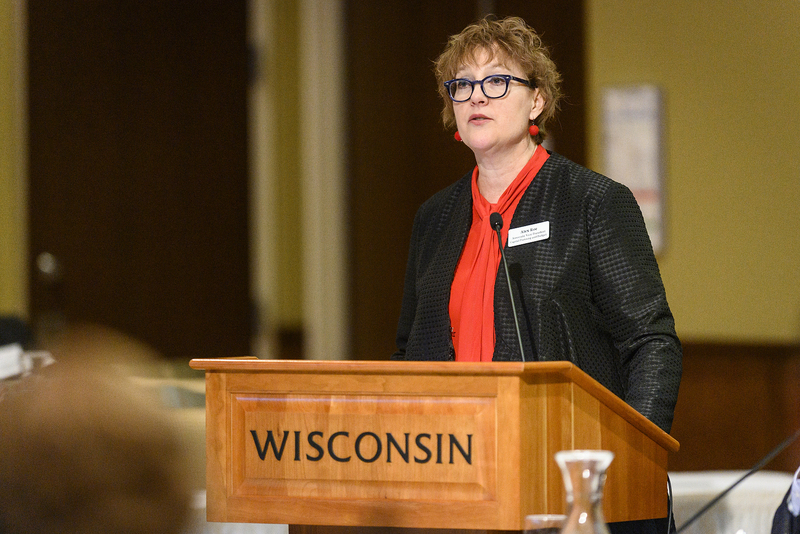 Last August, the Board approved support for the UW System’s 2019-21 budget request to fund necessary capital renewal activities across the UW System. The $1.9 billion Capital budget request includes 29 projects focused primarily on repair and renovation projects. Twenty-five of these requests are for renewal, renovation, or replacement projects, accounting for $1.8 billion. Roe reiterated the need to keep repair and renovation agendas as a high priority. “UW institutions work diligently to ensure our facilities are safe, secure, and provide the necessary teaching and research spaces our faculty and student require. Our physical plant staff endeavors to keep us operational so that the buildings are not negatively affecting the quality of the educational process,” Roe said. In her annual address to the Regents, Chancellor Rebecca Blank said UW-Madison has made important strides in the last few years, decreasing time-to-degree and increasing the six-year graduation rate while also conferring a record number of degrees and expanding the size of the freshman class. 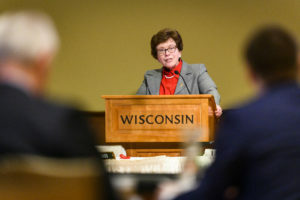 The Chancellor also shared several areas where UW-Madison is working to expand its programs and reputation, and she shared five top goals for the campus. Her goals are to maintain and further strengthen educational outcomes, expand access, grow research strength, maintain and grow faculty strength, and continue to build the university’s financial stability. “No two factors are more important to growth in a global economy than a deep pool of skilled workers and a strong base for innovation and discovery. This is what research universities do, which is why they are so important to our nation,” Blank said. Blank shared a number of examples of progress toward these goals and explained her strategies for continuing to move forward. To continue to strengthen educational outcomes, for example, Chancellor Blank said the campus will expand early-start programs to help freshmen get a jump start on their degree the summer before freshman year, grow gap year programs to give students the option of delaying their start in order to spend a year abroad or work on a service project, and build undergraduate online degree programs. 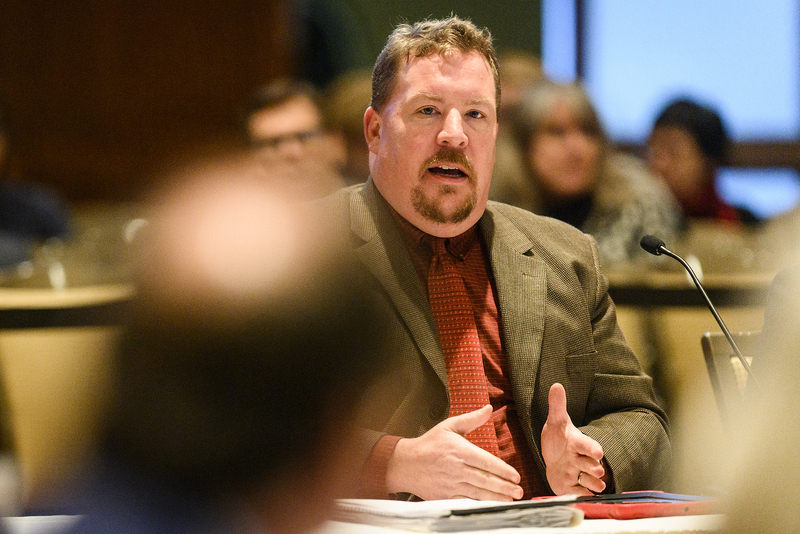 The President’s Sexual Violence and Harassment Priorities Working Group, which was created by President Ray Cross last year, has completed its broad review of UW System policies and practices related to sexual harassment and sexual violence. The working group, led by Senior Associate Vice President and Chief Human Resource Officer Shenita Brokenburr and Quinn Williams, UW System’s General Counsel, had 11 members from around the System representing diverse subject matter expertise, including human resources, Title IX, student affairs, and equity and diversity. Christopher Poquet, UW-Green Bay’s Assistant Vice Chancellor for Policy and Compliance and chair of the working group, told Regents the group is recommending that UW System continue its requirement that all employees and first-year students be required to take sexual misconduct prevention, reporting and resource awareness training. He said the group also recommends that UW System make available resources to institutions to facilitate periodic advanced training for personnel who respond to reports of sexual assault and other sexual misconduct. Other recommendations included establishing consistent workflows for processing of sexual assault incident reports and developing technological solutions for data collection of incidents of sexual misconduct. “This is a very important and sensitive topic. We have a responsibility to provide a safe campus for students, staff, and visitors,” said Regent Scott Beightol. President Cross noted that the biggest challenge is how to propagate a culture where sexual misconduct is not acceptable. “In this public venue we are saying this has got to stop,” Cross said. Ben Passmore, Associate Vice President for UW System’s Office of Policy Analysis and Research, provided the Education Committee with an update on initial discussions related to the use of the Education Advisory Board’s Navigate Student Success Management System (SSMS). The system uses predictive analytics to help identify what factors might cause students to struggle and to help develop strategies to address those challenges. “The idea of student success is absolutely core to our mission and we believe this initiative going to drive that forward,” Passmore said. The SSMS initiative will require a significant investment of dollars, time, and people, Passmore said, but retaining an additional 170 students across the system will offset the financial cost. 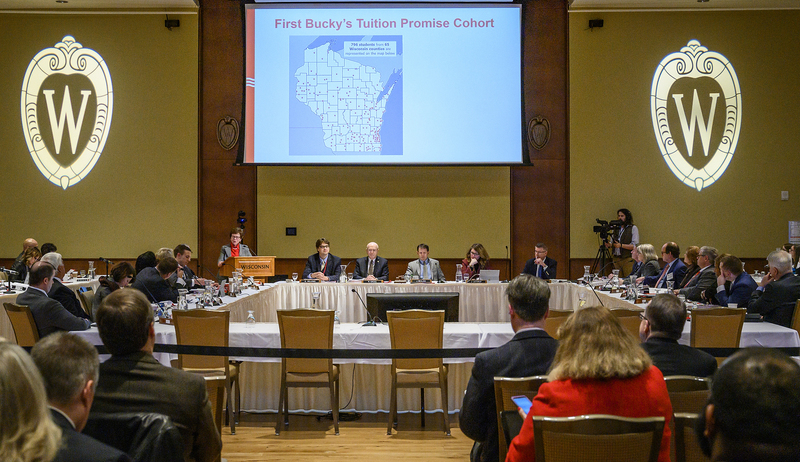 The Business and Finance Committee approved changes to nonresident and graduate student tuition rates at nine UW System institutions. Generally, these changes sought increases of between one and three percent. Additionally, UW-Milwaukee received approval to change the credit plateau for its Doctor of Physical Therapy (DPT) program from 8 to 10 credits. Students generally only pay for credits up to the plateau, and above that level they are not charged for the additional credits. UWM’s requested change to the plateau would help cover instructional costs and need-based scholarships while still keeping its rates in line with UW-Madison’s DPT program. Heard a semi-annual report of gift, grant, and contract awards for the period July 1, 2018, through December 31, 2018. Total awards for the period were approximately $827.8 million, an increase of $14.5 million compared to the prior year. Federal awards increased $53.3 million while non-federal awards decreased by $38.8 million. The Capital Planning and Budget Committee approved UW System’s Evaluation Criteria for Ranking Major Building Project Requests. Planning for 2021-2023 Capital Budget has begun and the criteria used for prioritizing major building projects has been updated to reflect current systemwide initiatives, priorities, and goals of the Board of Regents. The intended use of the criteria is to create a priority list of projects that addresses the greatest needs, highest academic priorities, and most cost-effective solutions to established facility deficiencies. Heard a report from Associate Vice President Alex Roe on progress of the Capital Budget. Norman Drinkwater, UW-Madison Interim Vice Chancellor for Research, provided an update on the UW2020 Discovery Initiative, which has provided 66 grants totaling approximately $25 million to faculty since its inception in 2015. The Wisconsin Alumni Research Foundation (WARF) is underwriting this initiative to further strengthen UW-Madison’s research capacity and global competitiveness. The goal is to foster new, highly innovative, collaborative research projects that will lead to multi-investigator extramural support, Drinkwater said. The initiative is also focused on creating new research infrastructure that will provide opportunities to advance cutting-edge research programs across the campus. Heard an update on the Regent Scholar Program by WiSys President Arjun Sanga and Regent Mark Tyler. The 2019 Regent Scholar faculty award recipients will be announced at the March Board of Regents meeting. UW System’s Assistant Vice President of Administration Ruth Anderson updated the Audit Committee on progress with enterprise risk management. UW System has established a system-level Risk Committee to evaluate and rank risks and then prioritize those risks based on likelihood of occurrence and impact. The UW System Risk Committee will also review existing mitigation plans for priority risks and work with risk owners to develop new plans if needed. Heard updates from Chief Audit Executive Lori Stortz on Fiscal 2019 Audit Plan progress, summarized results of audits recently issued, System security and access audit status, and progress by management on resolving comments and implementing recommendations for audit reports. See more photos from the February 7, 2019, meeting.